Suriname is a short video piece Lisse made in 2008 to demonstrate his camerawork and editing technique to prospective clients, and posted at YouTube. It is a sort of meditation on one of Paramaribo's residential neighbourhoods, slightly unsettling in its close-up observation of unexpected details of the landscape, with hints of urban ennui conveyed through time-lapse photography. See more of Lisse's video work at his YouTube page. The name Waka Tjopu is derived from an old-fashioned Surinamese marbles game, where the aim is reach a new and more distant target with each turn. The players try to touch -- to “tjop” -- and gather as many of their opponents’ marbles as possible. The name perfectly suits the activities of the artists’ collective set up in the 1980s, whose members were continuously stimulated by touching on the specialities of others in the multidisciplinary collective. 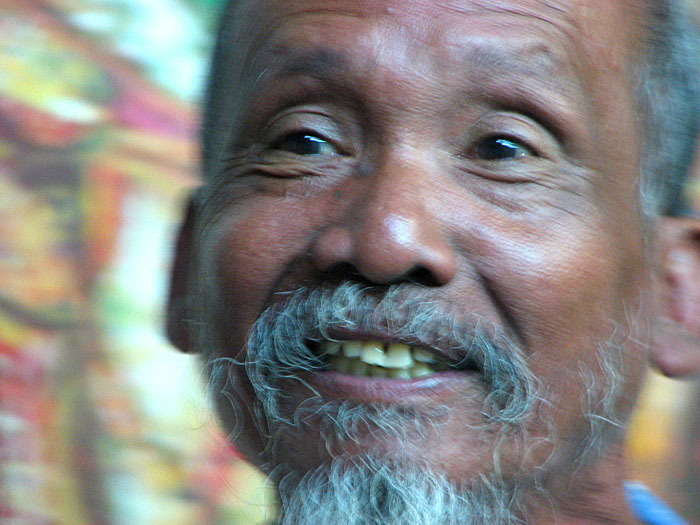 Visual artist and designer René Tosari founded Waka Tjopu in 1983. He played a leading and decisive role in its development until the end of the collective. Other members of the collective were the artists Soeki Irodikromo, Ray Daal, Steve Ammersingh, Winston van der Bok, John Djojo, and Ramin Wirjomingolo. Designers, illustrators, graphic designers, painters, decorators, ceramists, photographers, artists, sculptors, batik artists, and wood and metal craftsmen were all represented in the collective. What brought them together was their conviction about the practice of art: that art and society are inextricably linked to each other. 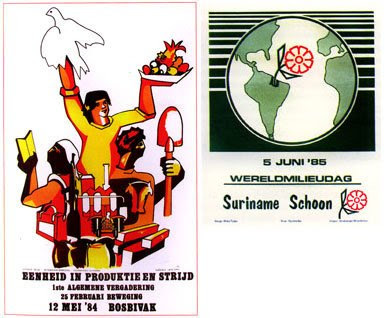 The climate in Suriname in the 1980s challenged them to make their own interpretation of values; a promise of progressive social renewal initially offered by the military coup. Waka Tjopu wanted its work to make a purposeful contribution to increasing the cultural identity and self-respect of Surinamese people. For its members, artistic manifestations had not only an authentic, expressive, and aesthetic value; they also thought that the foundation for developing works of art lay within the immediate social reality. This was the vision from which they worked. One Waka Tjopu project clearly expressed their deep and heartfelt connection with the environment. From 1983 to 1984 the artists regularly visited the district of Commewijne, where a number of them had their roots. The area had a rich plantation culture history, but few who remembered it. Among the run-down and dilapidated remains the Waka Tjopu artists found renewed inspiration for what would be their most remarkable enterprise, which they lovingly christened Terug Naar Huis (“Back Home”). As they wandered through the abandoned plantations they talked passionately about “art confrontations”, a term they often used to describe the creation of interactivity between social reality and artistic expression. They had close contact with the plantation inhabitants and shared their day-to-day activities, recording the entire district in paintings, sketches, and photographs; a triptych portraying the present, the past, and the future of the plantations on the right bank of the River Commewijne. The paintings, linked to an actual restoration project for the area, have a historical, a current, and a future portrayal of the area in the style of historical pieces. 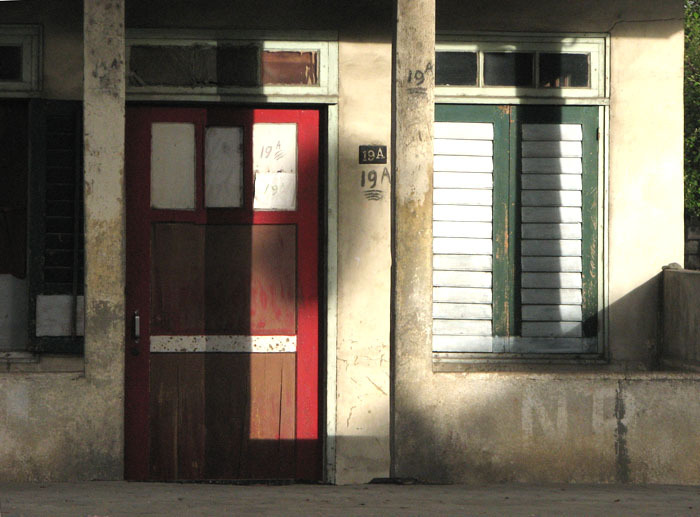 The Terug Naar Huis works represented Suriname’s participation in the prestigious 18th Biennale of Sao Paolo (1985), and were exhibited again in 1990, in Theater Thalia in Paramaribo. They are now housed in the Openlucht Museum in Nieuw Amsterdam, in Commewijne -- they are back home. During its seven years of existence, Waka Tjopu was engaged in a huge range of exciting activities including architectural works and designs, banners, and a television flash card series themed on original craft forms such as native ceramics, traditional basketwork, and wood carving. Art was also used to illustrate subjects such as standards and values, healthy eating and economic progress through production. These projects encompassed making district signs, designing complete house-styles for new companies, industrial design, making scale models, drawing postcards, caricatures and comic strips, and holding art workshops at schools in the city and in the districts. Waka Tjopu also felt very strongly about public service issues, such as good parenting and the value of local qualities. It was the collective that made the first, colourful giant signs in Suriname drawing attention to the importance of local production and good education for all. In addition Waka Tjopu also took on the design for the national industries rapidly emerging at this time, and was responsible for the design and furnishing of some major, high-profile production fairs showing locally produced goods. A spectacular example was the design, dressing, and performance for two historic processions with floats through Paramaribo in 1985, held to celebrate five years of revolution and ten years of independence. Waka Tjopu was entrusted in 1988 with designing a national AIDs campaign and all the associated informational material. 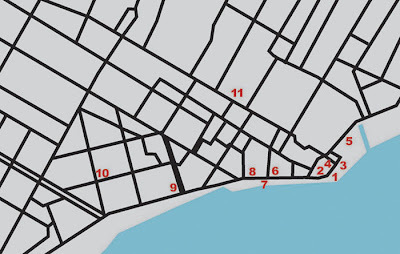 By now the collective’s work had expanded to include a city face-lift, applied art, and architecture. Members of the group were involved in designing and making objects and the decoration of interiors and building facades. For many years the facade of De Surinaamsche Bank was adorned with a number of greatly enlarged Surinamese coins including the old-fashioned two-and-a-half cent piece or “bigi sensi”, and the curious, square five-cent piece. The collective was actually disbanded in 1990, and the members continued with their creative work as individuals in their own discipline. Waka Tjopu occupies a unique position in the history of the visual arts in Suriname. This type of group experience for artists had never taken place before, and has never been repeated since. Their collaboration radiated a great deal of strength and inspiration. Not only did the Waka Tjopu members produce an enormous amount, but they also modernised due to their purposeful approach, focussed on social consciousness-raising. And they undeniably inspired subsequent generations of artists. Separate collections by two very different artists, each with a distinctive and unique style, although they each choose a strikingly bright colour palette, regularly use pangi textiles, and work from strong culturally inspired themes. The theme of Licht aan Zee AA is culture and cultural differences, with a focus on Africa and the Antilles. Guest curator Remy Jungerman, together with Iris Kensmil and Kurt Nahar, has presented a collection under the title "Born on Wednesday", following the Afro-Surinamese tradition of naming babies after the day they are born. Togetherness is about the "unity of the culture of the Afro-Surinamese urban population and the maroon people in the interior". Bijlhout completed his art education at the Nola Hatterman Art Academy in 2006. In 2008 he had his second solo exhibition, New Beginnings, in the Instituto Venezolano para la Cultura y la Cooperacíon (IVCC). We begin our round of studio visits, appropriately, by calling on Soeki Irodikromo, one of the elder figures of the Surinamese art scene. His paintings, ceramics, and batik work draw on Javanese myth and visual traditions but also on the methods and style of the COBRA movement, which he studied at close quarters when he was an art student in the Netherlands in the 1960s. For forty years, Soeki--everyone in Paramaribo refers to him by his first name--has thoughtfully but undogmatically explored notions of Suriname's cultural diversity and hybridity, and the country's uncertain place within the Caribbean cultural zone. Chris visited Soeki's studio last time he was in Suriname, and remembers being fascinated by a large painting created for Carifesta 2006. He hopes to see it again. Soeki's wife greets us at the front gate and shows us past a collection of small cacti (sheltered by a big striped umbrella) into an airy verandah screened by palms and other potted plants. Just above us a nervous small songbird flits about its bamboo cage. Soeki appears in the doorway, smiling, hands clasped. He asks if we will have coffee, then ducks inside to fetch it. "He's so fit!" Chris says. Soeki is small, wiry, energetic, dressed in a batik t-shirt. Chris remembers on his previous visit they spoke about fishing in the mouth of the Suriname River. Soeki appears again, with little cups of coffee, and we sit around a low table made from the section of a massive tree trunk. Chris asks about the caged bird. It is a twa twa, Soeki says--"the best kind of bird in Suriname." The picolet is second best. Last week someone stole his picolet from the verandah. Now he keeps the front gate locked. Thomas talks about our project, the exhibition and book. Soeki listens gravely. Chris asks about the Carifesta painting he saw five years ago. 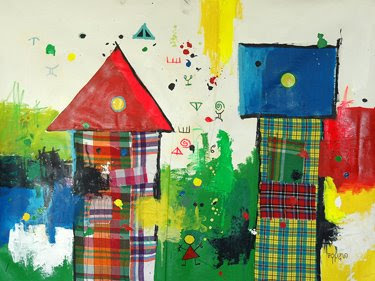 It was sold to a collector in the Netherlands, Soeki says, like much of his work. He opens a copy of the catalogue of his work published in 2005 and leafs through to the final section. The painting Chris remembers isn't in the book, but others from the series are. Eventually we ask if we can see some of his most recent work, and Soeki shows us inside. Hanging on his living room wall is a new painting called Ontmoeting--"The Meeting"--finished just "yesterday", Soeki says. Chris is immediately intrigued. 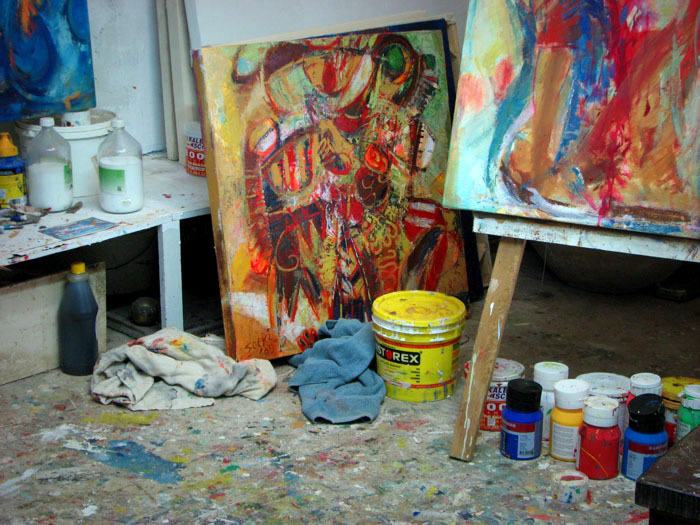 While he talks to Soeki about the work, I slip into his studio at the back of the house, behind the kitchen. Several canvases-in-progress stand on easels, or propped on a ledge along the wall. Soeki, Chris, and Thomas follow me into the room. Chris has shared the idea of the bridge as a thematic construct for the project. Soeki, warming to the idea, is talking about the Javanese community as a bridge between Afro- and Indo-Surinamese. In the taxi, heading back to central Paramaribo, Chris muses over the coincidental appropriateness of finding Ontmoeting prominently displayed in Soeki's house. Because of course a bridge is a kind of meeting, and Soeki's work is a bridge between late European Modernism and a cultural discourse particular to Suriname. Can we find, Chris wonders, a bridge between ideas about the role of painting among artists of Soeki's generation, and the work of contemporary Surinamese artists working in the medium of paint on canvas? Marieke Visser: The idea is clear: the fact that a bridge can bring worlds together is not necessarily a blessing. It should not be taken lightly. The bridge over the Suriname River is to me also a strong reminder of the May demonstrations in 1999, when many of us went out on the streets to protest the presidency of Jules Wijdenbosch. He was the one who built this visible bridge, this symbol of hope, of growth, of expansion. We shouted: "We don't want bread with bridge!" But after a few days everything went back to normal. And now, now and then, I notice thoughts in my own head like: "Well, at least he built something tangible for the country!" Chandra van Binnendijk: I am intrigued by this little poem. Not only because of its simple beauty, but because the poet refers to "silences", indicating there is more than just one silence. The creek supplies us with new silences, he says--and I wonder: Are these more of the same, or do we get a variety, will we get different kinds of silences each time the creek brings them to us? When playing around with these questions, my image of the bridge changed, it widened the scope of how we could look at a bridge. It is not just a construction which links one bank of a river to the other, but it also has something above it--air--and something underneath it--water or ground. The water brings new silences, but the water itself has many layers--there are the bubbles and the waves on the surface, but there are also the undercurrents. The same goes for the air above the bridge. So looking at a bridge in a wider sense we could see it as one (horizontal) layer of many in its wider surroundings. What does one see when looking at the surroundings while standing on the bridge? MV: I think of a friend, the visual artist René Tosari, the man behind Waka Tjopu. More than anyone I know, he is at home in both worlds: the artists in the diaspora and the artists at "home", but also the worlds of the older generation and the younger generation. I don't see him as a bridge builder or a bridge--it is more like that he is a person on the bridge, accepted by both worlds as someone who "belongs" to their world. When I think about this image, a man standing on the bridge, walking to both sides, sharing with people on both sides, I see how this is how I myself feel. That is also why the Wakaman Project was so exciting. It transcends that issue of home or away, of that recurring--and sometimes very irritating and time-consuming--question of which world we belong to. I don't want to choose, I am not willing to defend one world over another. But I do speak both languages, and I do miscommunicate in both languages as well. On both ends of the bridge are sources of inspiration, which I feel free to be inspired by. I have the feeling that more people are moving in that direction, and I see how the bridge can be a way to get out of a place that has become too limited, and maybe later on it is a means to return with new stuff in your suitcase. But also the bridge itself means a new freedom--it is like an opened window (to the future but also to the past). It is an opportunity to connect and to re-connect and to cut loose (disconnect) as well. Span is a word common to English, Dutch, and Sranan, via different etymologies, and with a range of meanings, nuances, implications. It is the space between two points, the means of crossing that space, a linking or pairing, a tension, a tightening, an excitement, a fullness, a reaching out. Paramaribo SPAN is a conversation about contemporary art and visual culture in Suriname, about art practice in a particular location at a particular time. The project has three separate but interconnected platforms: an exhibition, which will open in Paramaribo in February 2010; a book to be published in three editions (Dutch, English, Portuguese); and this blog, which is at once a journal, an archive, and an independent creative undertaking. 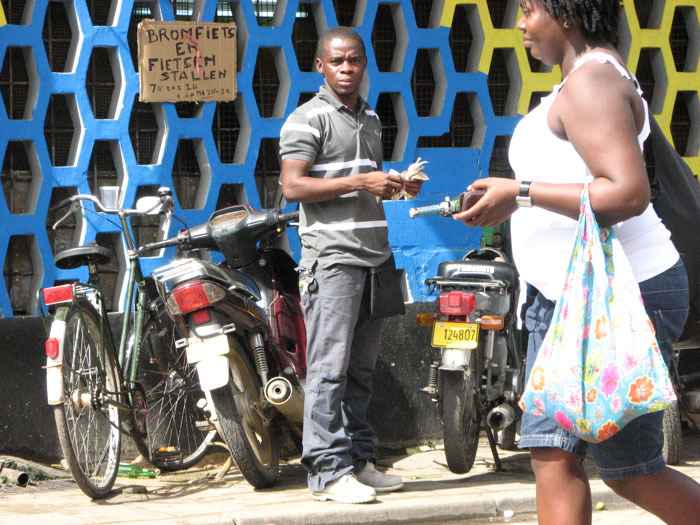 The project is, in part, a culmination of the ArtRoPa initiative, a four-year series of exchanges between artists based in Paramaribo and Rotterdam, intended to promote creative dialogue between these very different locations which are nonetheless linked by elements of history, culture, and language. The physical and social topography of each city has been changed in recent years by the construction of an iconic bridge. The Jules Wijdenbosch Bridge in Paramaribo, opened in 2000, links the city to the eastern region of Suriname. The Erasmus Bridge in Rotterdam crosses the Nieuwe Maas River and is a conscious symbol of the city's cultural ambitions. Paramaribo SPAN is itself conceived as a kind of bridge, between histories, social groups, countries, cultures--reaching between realities and aspirations. Between Suriname and the Netherlands, but also between Suriname and the Caribbean, and all the farther-flung locations that contemporary Surinamese artists engage with. The project is not an encyclopedic survey of Suriname's art history, or an inventory of "national" culture. Rather, it seeks to start a creative dialogue about individual artists' imaginative sovereignty, about public space and vernacular forms, about new media, about artists' slippery negotiations with the local and the global, and about possible future directions. The curators, writers, and others shaping the project come from Suriname, the Netherlands, and Trinidad, and draw on a long collective experience of tackling these questions, crossing these bridges. The Paramaribo SPAN blog, conceptualised by curator Christopher Cozier and realised in collaboration with editor Nicholas Laughlin, is a space for sharing working notes and fragments, not finished drafts; questions, not statements. It is a journal of the entire project, of the process of creating the exhibition and book. It draws on resources in Dutch and Sranan, but is written primarily in English, the global lingua franca. It examines the work of a range of contemporary artists, but also maps the whole creative space in which they work--images and sounds of contemporary Suriname, the urban topography of Paramaribo, literary perspectives, intersections with the wider Caribbean region. The blog will run for approximately eight months, from July 2009 until the end of the Paramaribo SPAN exhibition in March 2010, and thereafter become an online archive of the project. Please follow our conversation by following our RSS feed, and join in by leaving comments. Artist and writer based in Trinidad. He has participated in a number of exhibitions focused on contemporary art in the Caribbean and internationally. Since 1989 he has published a range of essays on related issues in several catalogues and journals. He is on the editorial collective of Small Axe: A Caribbean Journal of Criticism, published and distributed by Duke University Press. Cozier has been an editorial adviser to BOMB magazine for their Americas issues (Winter 2003, 2004, and 2005). He is a Senior Research Fellow at the Academy of the University of Trinidad & Tobago (UTT) and was Artist-in-Residence at Dartmouth College during the fall of 2007. Independent curator based in the Netherlands. He works for the Centre for the Arts Rotterdam (CBK Rotterdam) and has worked for the Rotterdam Arts Council and the Van Abbemuseum, Eindhoven; initiated and collaborated on many international projects and exhibitions, and organised guest residencies for Rotterdam-based artists in Berlin, Barcelona, and Istanbul. He was managing director of TENT.CBK and earlier of artists' club Arti & Amicitiae in Amsterdam, and was chairman of the committees of the Fonds BKVB (The Netherlands Foundation for Visual Arts, Design and Architecture) in Amsterdam. Artist based in Suriname. His work, which has been shown in numerous international exhibitions, draws on the history and culture of the Surinamese Ndjuka community, of which he is a member. He has created several monuments and memorial sculptures and installations for public locations in Suriname, and is working to establish an arts and culture centre at Moengo in the Marowijne district. For the Paramaribo SPAN project, Pinas is advising and mentoring a group of younger artists based in Suriname. Writer based in Suriname. She has been a journalist at various newspapers and radio stations in Suriname, and a correspondent for several Caribbean media houses. She was an editor of the weekly literature page for De Ware Tijd, and has been involved as co-author with a number of publications about the visual arts of Suriname. She is also a writer, producer, and co-director of local documentaries, and does research and production for film projects by international directors. Writer based in Suriname. She is the co-founder (with Karin Lachmising) of the creative communications company Tabiki Productions, and through her own press agency, Swamp Fish Press, she writes about art and culture. Born in the Netherlands, Visser as a child lived in Saudi Arabia, Burundi, Thailand, and Suriname. She returned to Suriname in 1993. The theme of her literary work is the quest for identity, a quest that makes her feel at home in Suriname, where people are struggling with the same questions as she is. Event management professional based in Suriname. Under the name Aco Multi Services she develops and produces art, culture, and tourism projects. At present she is the project manager for SURIFESTA, Suriname’s End of the Year Festivities, and the Suriname Jazz Festival. Writer and editor based in Trinidad. He is the editor of The Caribbean Review of Books, and has also edited a collection of essays by C.L.R. James (Letters from London, 2003) and a revised, expanded edition of V.S. Naipaul's early family correspondence (Letters Between a Father and Son, 2009). He edited the online archive for the 2006 Galvanize contemporary arts project in Port of Spain, Trinidad. He writes frequently about Caribbean literature and art, and is working on a book about Guyana, part travel narrative, part cultural history. = Sranan Art, images of artists, artworks, and art events in Suriname.